Not to be confused with Wallachia or Wallacia. Wallacea is the group of islands within the red area. The Weber Line is in blue. The islands of Wallacea lie between Sundaland (the Malay Peninsula, Sumatra, Borneo, Java, and Bali) to the west, and Near Oceania including Australia and New Guinea to the south and east. 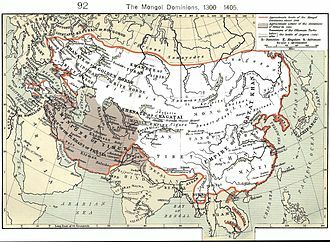 The total land area of Wallacea is 347,000 km². The Sahul and Sunda shelves. Wallacea is the area in between. The boundary between Sundaland and Wallacea follows the Wallace Line, named after the naturalist Alfred Russel Wallace who recorded the differences between mammal and bird fauna between the islands on either side of the line. The islands of Sundaland to the west of the line, including Sumatra, Java, Bali, and Borneo, share a mammal fauna similar to that of East Asia, which includes tigers, rhinoceros, and apes; whereas the mammal fauna of Lombok and areas extending eastwards are mostly populated by marsupials and birds similar to those in Australasia. Sulawesi shows signs of both. During the ice ages, sea levels were lower, exposing the Sunda shelf that links the islands of Sundaland to one another and to Asia, and allowed Asian land animals to inhabit these islands. The islands of Wallacea have few land mammals, land birds, or freshwater fish of continental origin, who find it difficult to cross open ocean. 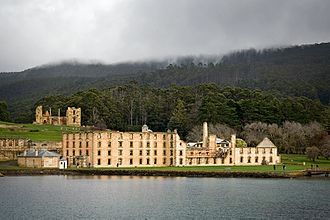 Many bird, reptile, and insect species were better able to cross the straits, and many such species of Australian and Asian origin are found there. Wallacea's plants are predominantly of Asian origin, and botanists include Sundaland, Wallacea, and New Guinea as the floristic province of Malaya. Similarly, Australia and New Guinea to the east are linked by a shallow continental shelf, and were linked by a land bridge during the ice ages, forming a single continent that scientists variously call Australia-New Guinea, Meganesia, Papualand, or Sahul. 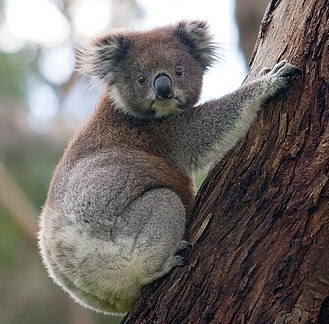 Consequently, Australia, New Guinea, and the Aru Islands share many marsupial mammals, land birds, and freshwater fish that are not found in Wallacea. The line dividing Wallacea from Australia–New Guinea is called Lydekker's Line. The Philippines is usually considered a separate region from Wallacea. The Weber Line is the midpoint where Asian and Australian fauna and flora are approximately equally represented, and follows the deepest straits traversing the Indonesian Archipelago. A map of Wallacea, bordered by the Wallace and the Lydekker Line. 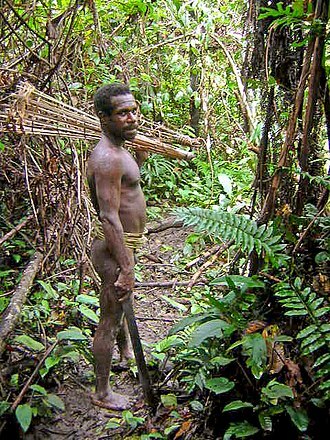 Although the distant ancestors of Wallacea's plants and animals may have been from Asia or Australia-New Guinea, Wallacea is home to many endemic species. There is extensive autochthonous speciation and proportionately large numbers of endemics; it is an important contributor to the overall mega-biodiversity of the Indonesian archipelago. Because many of the islands are separated from one another by deep water, there is tremendous species diversity among the islands as well. 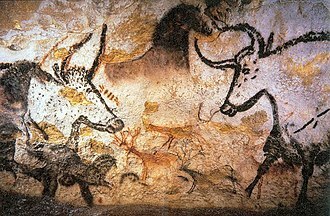 Fauna species include the endemic anoa (dwarf buffalo) of Sulawesi and the babirusa (deer pig). Maluku shows a degree of species similarity with Sulawesi, but with fewer flora and fauna. 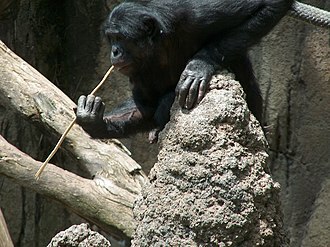 Smaller mammals including primates are common. Seram is noted for its butterflies and birdlife including the Amboina king parrot. Wallacea was originally almost completely forested, mostly tropical moist broadleaf forests, with some areas of tropical dry broadleaf forest. The higher mountains are home to montane and subalpine forests, and mangroves are common in coastal areas. According to Conservation International, Wallacea is home to over 10,000 plant species, of which approximately 1,500 (15%) are endemic. Endemism is higher among terrestrial vertebrate species; of 1,142 species found there, almost half (529) are endemic. 45% of the region retains some sort of forest cover, and only 52,017 km², or 15 percent, is in pristine state. Of Wallacea's total area of 347,000 km², about 20,000 km² are protected. Wallacea is home to 82 threatened and six critically endangered species of terrestrial vertebrates. 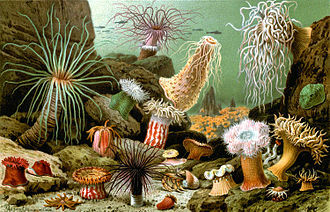 Australia may be isolated by sea, but technically through Wallacea, it can be zoologically extended. An example of evidence for when Wallacea formed exists at the Bluff Downs fossil site in northern Australia. Remains of basaltic lava show past oceanic subduction as Australia plowed north through the Pacific. At the site, one of the earliest Australian rodent fossils has been found. 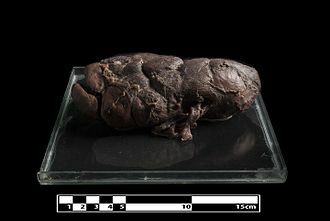 Australia's rodents make up much of the continent's placental mammal fauna and include various species from stick-nest rats, hopping mice, and even giant beaver rats. Other mammals invaded the west. 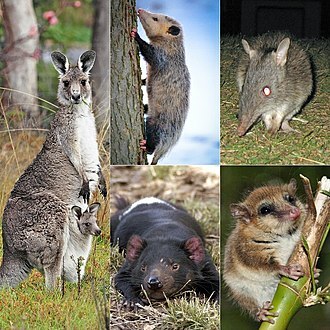 Two species of cuscus from Sulawesi are among the most primitive possums in the world and the only marsupials in Asia. Birds have expanded their range to and from Australia. Crows and shrikes invaded south into New Guinea and some into the Australian continent. Bustards and megapodes must have somehow colonized Australia. Cockatiels similar to those from Australia inhabit Komodo Island in Wallacea. ^ Irfan Budi Pramono and Ag. Pudjiharta (1996). "Research Experiences on Eucalyptus in Indonesia," in Reports submitted to the regional expert consultation on eucalyptus, Vol. II. Food and Agriculture Organization, Regional Office for Asia and the Pacific, Bangladesh. ^ Hausdorf, B. (2019). "Beyond Wallace's line – dispersal of Oriental and Australo-Papuan land-snails across the Indo-Australian Archipelago". Zoological Journal of the Linnean Society. 185 (1): 66–76. doi:10.1093/zoolinnean/zly031. Abdullah MT. (2003). Biogeography and variation of Cynopterus brachyotis in Southeast Asia. PhD thesis. University of Queensland, St Lucia, Australia. Corbet, GB, Hill JE. (1992). The Mammals of the Indomalayan Region: A Systematic Review. Oxford University Press, Oxford. Hall LS, Gordon G. Grigg, Craig Moritz, Besar Ketol, Isa Sait, Wahab Marni and M.T. Abdullah. (2004). "Biogeography of fruit bats in Southeast Asia." Sarawak Museum Journal LX(81):191–284. Wilson DE, Reeder DM. (2005). Mammal Species of the World. 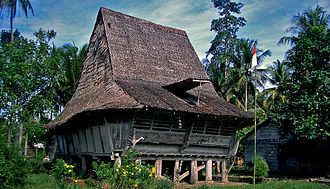 Smithsonian Institution Press, Washington, D.C.
Seram is the largest and main island of Maluku province of Indonesia, despite Ambon Islands historical importance. It is located just north of smaller Ambon Island, Seram is traversed by a central mountain range, the highest point of which, Mount Binaiya, is covered with dense rain forests. Its remarkably complex geology is because of its location at the meeting of several tectonic microplates, Seram actually falls on its own microplate, which has been twisted around by 80° in the last 8 million years by the relatively faster movement of the Papua microplate. Meanwhile, along with the push of the Australian Plate. On the island are important karst areas, in the mountains near Sawai is the cave Hatu Saka, currently the deepest cave in Indonesia. In Taniwell district, on the north coast, is the underground river Sapalewa, Seram Island is remarkable for its high degree of localised bird endemism. The mammals found on Seram include Asian species as well as Australasian marsupials, the montane area of Seram supports the greatest number of endemic mammals of any island in the region. It harbors 38 mammal species and includes nine species that are endemic or near endemic and these include the Seram bandicoot, Moluccan flying fox, Seram flying-fox, Manusela mosaic-tailed rat, spiny Ceram rat and the Ceram rat, all considered threatened. Saltwater crocodiles exist within some of the rivers, including the Salawai River. In the eastern part of the island, Manusela National Park has been established in 1997, most central Moluccans consider Seram to be their original ancestral home and it is still known colloquially as Nusa Ina. 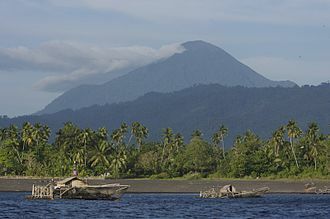 In the fifteenth and sixteenth centuries, Seram was generally within the sphere of influence of Ternate, the expedition of António de Abreu and Francisco Serrão sighted and explored the entire southern coast of Seram in early 1512, for the first time for Europeans. Portuguese missionaries were there in the 16th century. 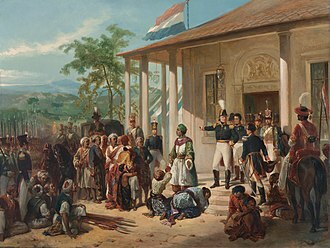 Dutch trading posts were opened in the early 17th century, in the 1780s, Seram provided a key base of support for Prince Nuku of Tidores long-running rebellion against Dutch rule. Timor is an island at the southern end of Maritime Southeast Asia, north of the Timor Sea. The island is divided between the states of East Timor, on the eastern part, and Indonesia, on the western part. The Indonesian part, known as West Timor, constitutes part of the province of East Nusa Tenggara, within West Timor lies an exclave of East Timor called Oecusse District. The island covers an area of 30,777 square kilometres, the name is a variant of timur, Malay for east, it is so called because it lies at the eastern end of the Lesser Sunda Islands. Anthropologists identify eleven distinct ethno-linguistic groups in Timor, the largest are the Atoni of western Timor, and the Tetum of central and eastern Timor. Most indigenous Timorese languages belong to the Timor–Babar branch of the Austronesian languages spoken throughout the Indonesian archipelago, the non-Austronesian languages are thought to be related to languages spoken on Halmahera and in Western New Guinea. Some are so mixed it is difficult to tell which family they descend from, the official languages of East Timor are Tetum and Portuguese, while in West Timor it is Indonesian. 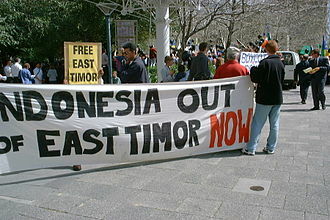 Indonesian is spoken and understood in East Timor. Islam and Animism make up most of the remainder at about 5% each across the island, Timor is located north of Australia, and is one of the easternmost Sunda Islands. Timor is the island of the Outer Banda Arc, which has been upthrust by collision with the Australian continent. Timor has older geology and lacks the volcanic nature of the northern Lesser Sunda Islands, the orientation of the main axis of the island differs from its neighbors. These features have been explained as the result of being on the edge of the Indo-Australian Plate as it meets the Eurasian Plate. The climate includes a dry season with hot winds blowing over from Australia. Rivers on the island include the Southern and Northern Laclo Rivers in East Timor, the largest towns on the island are the provincial capital of Kupang in West Timor and the Portuguese colonial towns of Dili the capital, and Baucau in East Timor. Poor roads make transport to inland areas difficult, in East Timor especially, East Timor is a poor country, with health issues including malaria and dengue fever. East Nusa Tenggara is the southernmost province of Indonesia. 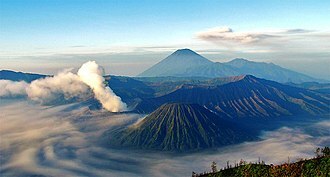 It is located in the part of the Lesser Sunda Islands. 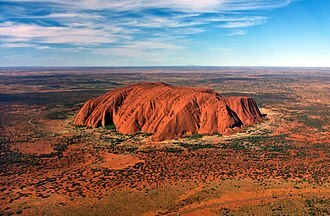 It has an area of 48,718.1 km2, and the population at the 2010 Census was 4,683,827. The provincial capital is Kupang on West Timor, the province consists of more than 500 islands, the three largest being Flores and the western half of Timor. The eastern part of Timor is the independent country of East Timor, East Nusa Tenggara is the only province in Indonesia where Roman Catholicism is the predominant religion. Nusa Tenggara Timur, in Indonesian, means eastern southeastern islands, compare to Nusa Tenggara Barat, after the declaration of Indonesian independence in 1945, the eastern part of Indonesia declared the State of East Indonesia. The state was included in the United States of Indonesia as part of the agreement with the Dutch contained in the transfer its sovereignty to Indonesia in 1949. In 1950, United States of Indonesia dissolved itself into a unitary state, in 1958, by Indonesian law No. 64/1958, three provinces were established in the Lesser Sunda Islands, namely Bali, West Nusa Tenggara, the area of East Nusa Tenggara province included the western part of Timor island, Flores and other several small islands in the region. 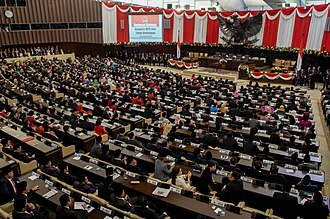 The province was sub-divided into twelve regencies and the City of Kupang, following the fall of the Suharto regime in 1998 and the passage of a new regional autonomy law, there was a dramatic proliferation of regional governments across Indonesia. Several new regencies were created in East Nusa Tenggara by the division of existing regencies, In 1999, in 2002, Rote and Ndao Islands were split off from Kupang Regency, to form a new Rote Ndao Regency. In 2003, Manggarai Regency was split into two and a new West Manggarai Regency was established, in 2007, the administration of East Nusa Tenggara province was expanded by the establishment of four new regencies - Central Sumba and Southwest Sumba and East Manggarai. In October 2008 a further regency - Sabu Raijua - was formed part of the remaining Kupang Regency. The Sasak chiefs of Lombok who allied with the Dutch to resist Balinese occupation. President Joko Widodo examining the earthquake damage. Komodo, one of the small islands in this province. Lontar palm has high significance in local agricultural. A photograph from Wallace's autobiography shows the building Wallace and his brother John designed and built for the Neath Mechanics' Institute. The Darwin–Wallace Medal was issued by the Linnean society on the 50th anniversary of the reading of Darwin and Wallace's papers on natural selection. An illustration from the chapter on the application of natural selection to humans in Wallace's 1889 book Darwinism shows a chimpanzee. 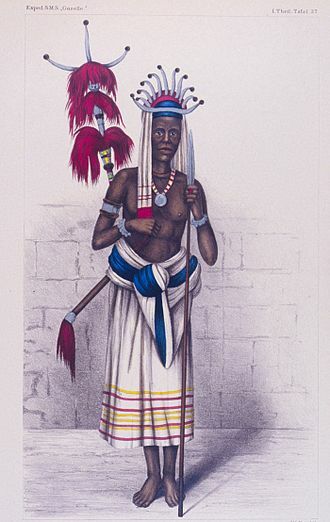 Portrait of a Timorese warrior at the area of Kupang in 1875 from report of expedition of German SMS Gazelle. House of the Dutch Resident in Kupang (c. 1900). Molo chief with delegation visiting Dutch representative in Babau.